As Chris Jaffe has detailed, June 23 marks the 40th anniversary of one of the most remarkable days a major league pitcher has ever experienced. Over the weekend, I had the chance to talk to Rick Wise, who visited Cooperstown to participate in the Hall of Fame Classic. In addition to his 1971 masterpiece, the right hander remembered another important milestone in his career. Wise: Well, even Sunday (Father’s Day) is the 47th anniversary of my first major league win, on Father‘s Day. I certainly won’t forget that one. Markusen: All right, let’s start with that. 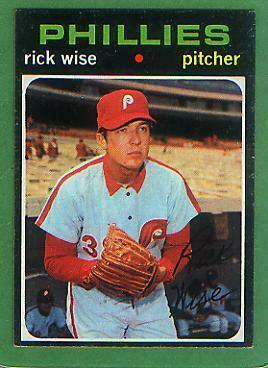 Wise: I had to follow a perfect game. I certainly won’t forget that one. Jim Bunning pitched a perfect game—we had a doubleheader—at Shea Stadium. I was 18 years old and got a spot start there. I remember before the game looking for a ball. I said, “I need a ball; I’ve gotta warm up! That was quite a memory of my first major league win. Markusen: You have good attention to detail and recall for something that happened a long time ago. Wise: Well, you know, athletes have that ability, I guess. When it’s that memorable, your first major league win, and then almost seven years to the day (after that), I pitched my no-hitter with the two home runs. I got the ball, the bat, and the glove from that game inducted into the Hall of Fame here in Cooperstown. June 23. So it’s 40 years. Markusen: Let’s talk more about that game against the Reds. What did you have going for you in terms of pure stuff on the mound? What do you remember in terms of the pitching part that day? Wise: Well, I felt warming up that I better locate my pitches because I was coming off the effects of the flu. I felt very weak that day. But it was my turn to start nevertheless. So warming up, it seemed like the ball was stopping halfway down to the catcher. So I said to myself that I better locate my pitches well. I sweated out the remnants of the flu through the first inning; it was very hot on the carpet at Riverfront (Stadium). But I had a good rhythm. They were putting the ball in play early; it was 94 pitches in an hour and 53 minutes, and the game was over, so it went right along. Of course, I added the two home runs. One in the fifth off Ross Grimsley, and then one off a reliever there, in the eighth inning. It was Clay Carroll, a very fine reliever at that time. Markusen: From a hitting standpoint, Rick, the two home runs in one day. That had to be a bit of a surprise. Wise: Well, not really. I had six home runs that year. I hit two home runs in a game twice that year. I tied a National League record. And one of those home runs was a grand slam, as a matter of fact. But I worked at hitting. I was always a good hitter, growing up in Little League, Babe Ruth, American Legion ball, high school ball, I was always hitting third or fourth. I had 15 home runs my first nine years in the National League, and then I went to the American League and never hit another one. Even though I came back after four years with Boston and two years with Cleveland. I came back to the National League (with the Padres) but my hand/eye coordination was long gone after six years of not hitting (because of the DH). It was a very special day. Markusen: That was a good lineup you faced that day. As the game went along, and as it got closer (to the end), it was only 4-0. I made it 4-0 with a solo home run in the eighth. But they were capable of bunching a lot of hits together and scoring a lot of runs quickly. So I wasn’t letting my guard down. But I had a good rhythm and was hitting my spots. And there were a couple of nice plays behind me, but nothing really exceptional. It was very memorable to say the least. There’s been like 20 perfect games, or something like that (Wise missed a perfect game because of just one walk), but I’m the only one to pitch a no-hitter and hit two home runs in the same game, so it’s pretty special. I’ll never forget it, for sure. I was the home plate umpire for that game and afterwards I had Rick sign a ball for me. Still remember the game very well, especially the last batter (Pete Rose) with a 3-2 count before lining out to 3B. Great memories.